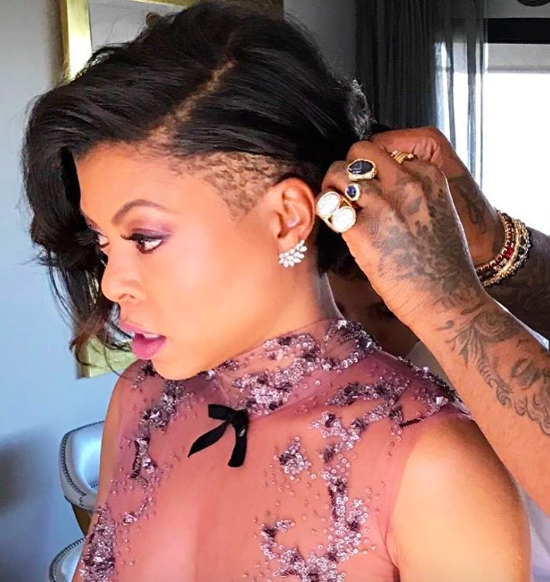 Actress Taraji P. Henson dazzled in designer Reem Acra and made a powerful plea for unity as her film Hidden Figures took home the award for Outstanding Performance by a Cast in a Motion Picture at the 2017 Screen Actors Guild Awards. She also slayed with a “chic but edgy undercut style” created by celebrity hairstylist Tym Wallace. "When thinking about Taraji's look- wanted to focus on her inner beauty and personality. Her versatility and command of any screen translates -- from Empire’s ‘Cookie Lyons’ to Hidden Figures’ "Katherine Johnson’,” explains the stylist. 1) Cleanse natural hair with L'Oréal Paris Sulfate-Free shampoo and conditioner, followed by It’s a 10 Leave-in Miracle Product. 2) Next, section the hair and blowdry with an Olivia Gardner round brush and fav tool, Dyson Supersonic hair dryer. 3) Once dry, section the hair to create an edgy undercut with Wahl Clippers. 4) Next, create large waves using the Harry Josh ProTools Ceramic Styling Iron. Bonus: Add a little pop with custom-colored Indique hair extensions using Pravana color system. 5) After letting the waves set, brush out downward using a small Mason Pearson brush. 6) Finish with ORIBE Apres Beach Wave and Shine Spray and Moroccanoil Luminous Hairspray Strong Finish.